The Alaska House Finance Committee has proposed a budget that reduces state spending by $314 million, less than a third of Gov. Mike Dunleavy’s proposed cut of $1.03 billion. The committee finished its work on Friday, proposing cuts that are much greater than those proposed by House subcommittees. The largest single cut was $68 million, by eliminating the debt service the state has provided municipalities to build and repair public schools. The Legislature had at least temporarily stopped doing this for new bonds four years ago. But this latest action would affect all existing debt service. That’s directly going to lead to property tax increases in much of the state. Along with that reduction, the committee’s budget would also spend $40 million less on school construction in the schools that are in the Unorganized Borough. And the House also agreed to $58 million in cuts to Medicaid, which is much less than Dunleavy’s goal of $225 million in cuts. Dunleavy’s administration has spelled out $95 million of the cuts. But the rest may not materialize in the next year. And committee members said didn’t want to count on savings that will be difficult to achieve. The committee voted 9-2 to cut Medicaid funding for abortions. If the change makes it into the final budget, it may not withstand a legal challenge. The Alaska Supreme Court has rejected previous legislative attempts to restrict Medicaid funding for abortions. The biggest contrast with Dunleavy’s proposal is in public education. 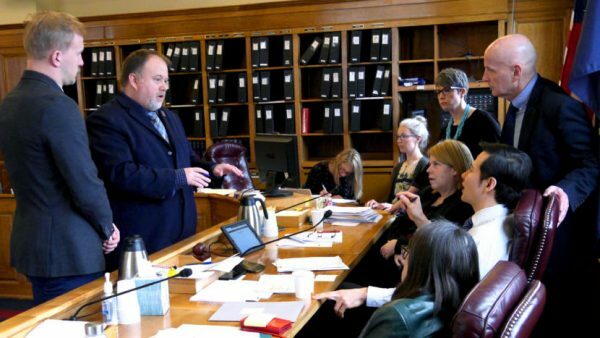 Dunleavy would reduce state funding for the Department of Education and Early Development by $309 million, while the House Finance Committee’s version would increase it by $2.8 million. The committee cut state funding for the university by $10 million, compared with Dunleavy’s $133 million proposed cut, while the committee’s $10 million reduction to the Alaska Marine Highway System was scaled back from the $64 million cut the governor proposed. The committee voted to cut funding for dairy inspections, which the operator of the state’s only dairy has said could lead to its closure. And the committee voted to end the Ocean Rangers program, which will end checks on whether cruise ships are complying with anti-pollution laws. The committee’s proposed budget doesn’t draw on $420 million in oil property taxes that the governor has proposed would go to the state instead of municipalities. And it didn’t include a $172 million draw on the Statutory Budget Reserve. Dunleavy proposed using that money as a backstop in case Medicaid reductions fall short. The committee budget apparently depends on funding Alaska Permanent Fund dividends at a lower level than is set by a legal formula used before 2016. While Dunleavy campaigned on having PFDs of roughly $3,000, the House budget would reduce dividends to an amount less than the $1,600 Alaskans received last year. However, further cuts on the House floor or in the Senate could lead to dividends that are similar to or higher than $1,600. The Senate minority has proposed cutting oil and gas production tax credits to eliminate the need for dividends cuts. But that proposal hasn’t advanced in the Senate, and the House hasn’t discussed a similar approach. Oil industry advocates have said the credits are an essential feature of the state’s oil tax system. Without any new revenue sources, every dollar that Dunleavy proposed cutting that isn’t included in the budget must be offset with a dollar reduction in dividends. Lawmakers have cited the public outcry against reductions in state-funded services for having smaller reductions. The House is set to begin debating amendments on the floor on Tuesday.